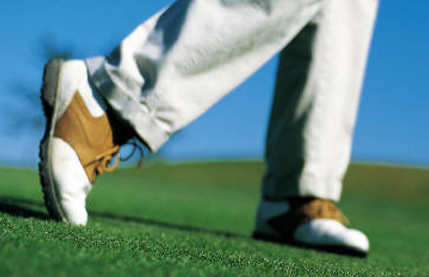 Golf shoes come in many shapes and styles, just like feet. It is important to match the shoe with your foot to maximize comfort but also function. Built in anatomical arch support. Removable foot bed that is hand washable with resilient natural latex/cork with organically tanned suede lining. Polyurethane outsole to reduce stress to joints. Scorpion shaped removable soft spikes with steel rivets for extra traction and grip power. Removable insoles to accommodate custom-made orthotics. The bottoms of your feet are three dimensional and unique to you, obtaining custom molded functional orthotics for your shoes will maximize the function of your feet. This will assist in the transfer of energy from the ground to your club. Energy can be wasted in its transfer from the ground through your feet. Lost energy means less power. Adjustable depth to accommodate your instep. Too much pressure on top of your feet will affect your joint motion. It can even end up causing pain. Even a little discomfort may affect your game. ideal fit by a professional that understands matching the ball of your foot with the bend of the shoe is probably the most important factor. A well designed shoe will not assist your function if it is not an ideal fit. That is, you will be losing energy in your feet. At ArchMasters we’ve chosen to carry The Finn Comfort Men’s Saddle Golf Shoe, the Augusta. It contains all the features above. Handmade and stitched in Germany by master shoe makers to afford a long lasting quality and functional comfortable and stylish shoe. Especially if you are a walking golfer, you will find this shoe assists you for the entire game. Maximize your energy transfer. Go for the birdies, even the eagles. Stop by ArchMasters today. ArchMasters-Orthotics, Shoes & Footcare, llc. The only shoe store in Nashville with a doc in every shoebox!